Penny + Giles is supplying its STT280 tilt sensors to Stellar Industries for a boom angle positioning application on its range of truck-mounted telescopic winch-line cranes. Established in 1990 in Garner,Iowa, Stellar Industries was the first North American company to design and manufacture the hydraulic hooklift. 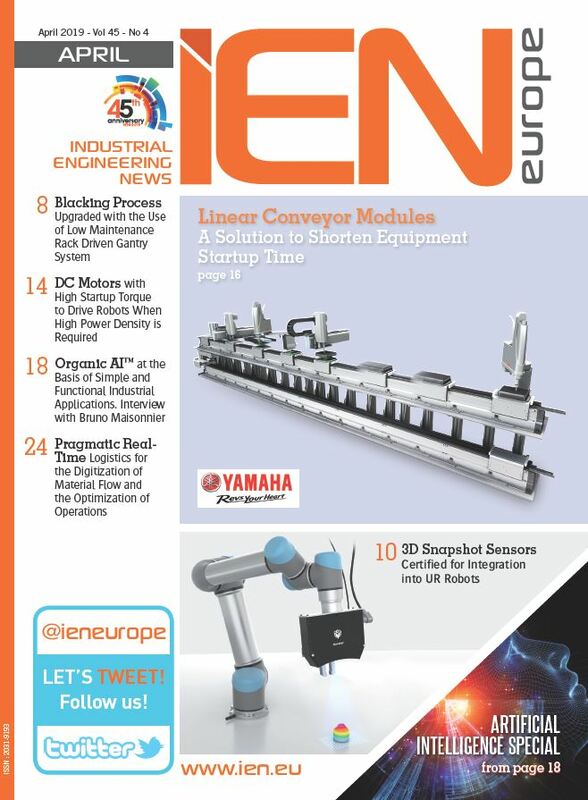 Since its inception Stellar has created over forty different single-pivot, double-pivot and sliding jib models and now holds numerousUS patents on the Stellar Shuttle double-pivot hooklift. The Penny + Giles STT280 tilt sensors are being used on Stellar's range of service/mechanic truck packages, which feature telescopic winch-line cranes mounted on service truck bodies. 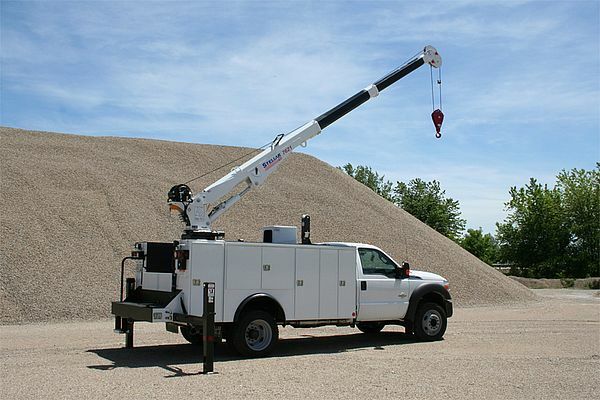 These vehicles are typically used by utility and municipal companies and related service industries requiring heavy lifting over long ranges. The truck-mounted cranes offer lifting capabilities from 29,500 foot pounds capacity (capable of lifting 5,000 pounds at approximately six feet) to 82,600 foot pounds, which are capable of lifting 14,000 pounds at five feet. All models feature a boom elevation from -5 to +80 degrees. Stellar's 5521 telescopic crane is the first model in the range to feature the Penny + Giles tilt sensors and the first to use Stellar's CDT (Crane Dynamics Technology™) control system. It offers a maximum 5,000 pound capacity at 5' 9" in boost mode, has a 21-foot reach and offers two options: a 'one hydraulic/one manual' extension version and the company's all-new 'two hydraulic' extension version. Commenting on the choice of Penny + Giles tilt sensors, Stellar's sales and marketing manager Sean Moran says: "The main reason for specifying the STT280 is the compact design, which allows us to mount them in discreet locations on the cranes. A close look at the company itself also showed that Penny + Giles products are used extensively in defence and military applications, confirming that their products are robust and manufactured to an extremely high quality. This makes them ideal for the arduous operating environments demanded of our telescopic crane systems." The STT280 tilt sensors are integral to Stellar's CDT smart control system. They are used to measure the angle of the telescopic boom, enabling the CDT to calculate the load on the crane and transmit the data from the sensor to a handheld controller. This controller features a graphical user interface that uses multiple sensory indicators (coloured LED lights and pulsating vibrations) to alert operators of increasing loads before an overload situation occurs. The use of cyclical vibrations in the controller ensures that the operator is always aware of approaching maximum capacity, while still being able to monitor the load itself. Before the tilt sensors were installed the only safety system in place was a pressure sensor on the hydraulic system that would shut the crane down as it reached a defined load. Summarising, Sean Moran says this is the first time this type of telescopic system has used tilt sensor technology to relay crane condition and operation to the operator, which puts Stellar and Penny + Giles at the forefront of service crane technology in the US market. 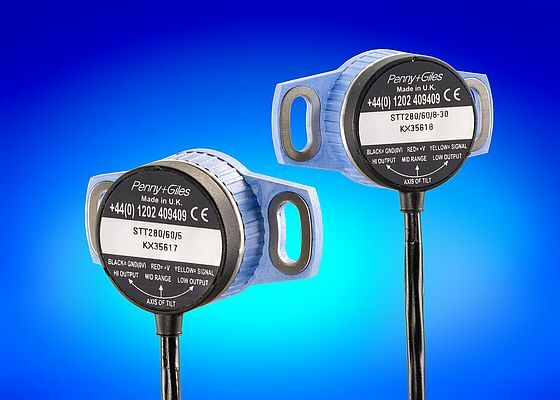 The Penny + Giles STT280 tilt sensor features a choice of measurement ranges from ±10°, ±20°, ±30° and ±60°, with an output range from 0.5 to 4.5Vdc over the full inclination angle and a nominal 2.5Vdc at 0° tilt. It can also operate from a 5Vdc regulated or 8 to 30Vdc unregulated supply and uses solid state 3D-MEMS (Micro-Electro-Mechanical Systems) technology to measure its inclination relative to earth's gravity. This means the sensor has a low power requirement of less than 6.5mA, and can therefore be used in hard-wired or battery-powered systems. This gives the STT280 significant advantages in reliability, stability and compactness compared to fluid-based electrolytic and pendulum-operated sensors.